The purpose of this page is to look at small home office design in terms of the dimensions of the space and different furniture arrangements. Maybe you're trying to figure out if you can use that small alcove for an office. 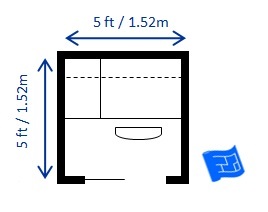 Maybe you're in the design phase and want to know how much space you need for a small home office space. Either way, this page should give you some benchmarks and ideas to start from. All of the office spaces that are featured here are smaller than the minimum size of 70sqft for a habitable room. If you're looking at a bigger space for a home office check out these home office floor plans. This page is part of the home office design series. 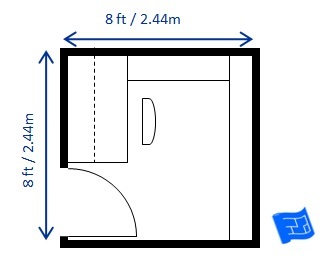 Here's small office dimensions for an office in a closet or alcove. If you use a stool for seating it can be pushed under the desk so that the doors can be closed. Here's an example of a floor plan of a small home office design under the stairs. This one houses a 5 x 2½ft (152 x 76cm) desk and there's room for the chair to be pushed in behind the bi-fold doors. Depending on the layout of your stairs you might be able to carve out some additional space for storage under lower level stairs. The next small home office design is an office booth. This arrangement is handy if the spare space you have is oriented with the thinner side accessible as the entry to the space. It's basically a restaurant booth or kitchen nook with seating only on one side. One advantage of this space is that the door can be closed while someone works in the office. While it might seem a tiny space it can be great for focusing on getting your work done. 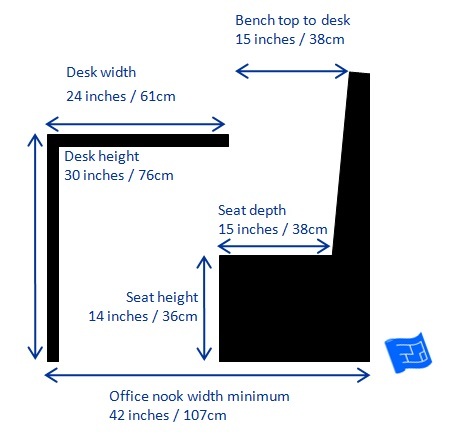 This booth houses a desk 4 x 2½ft (122 x 76cm). I'm struggling to find a word to describe the next size up of small home office designs but I've decided on 'cubby'. 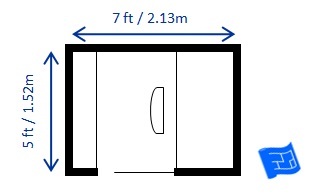 These are small rooms but still below the minimum room size of 70sqft. I haven't put windows in these designs but if your cubby ends up being in a location with a window all the better. 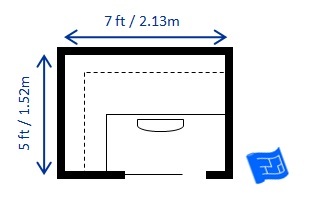 Above is a 5 x 5ft (1.52 x 1.52m) small office cubby hole. It's arranged with a 5ft x 2½ft (152 x 76cm) desk with set of drawers to the left. The door needs to swing to the outside, or if it's possible, depending on the surrounding walls, a sliding door is ideal. 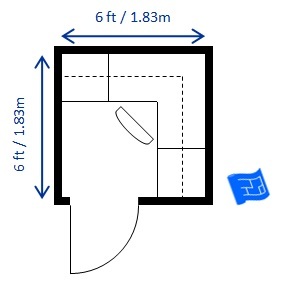 This 7ft x 5ft small home office design (above) houses an L shaped desk. 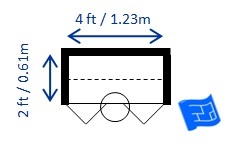 The main desk is 5ft x 2½ft (152 x 76cm) with the addition of a left hand return sized 5ft x 2ft (152 x 61cm). Naturally the return could you on the right hand side if you prefer. Or you could decide to go without the return and have a wall of shelves instead. Here's another furniture arrangement (below). Here's a 6 x 6ft (1.83 x 1.83m) office with a corner desk featuring drawers at each of the far corners from the chair and shelving above the desk. Getting a bit bigger but still under the legal room size of 70sqft here's an 8 x 8ft (2.44 x 2.44cm) office. 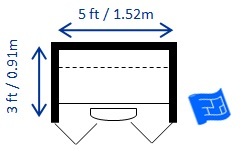 To make a corner desk more usable, consider having the corner flattened off so that you have an area of desk immediately in front of you rather than having to reach too far forward. Here's just a few tips that I couldn't finish writing this page without including. I haven't put a windows in these designs, but a small window, with a thoughtful twist, would make your small home office space all the more pleasant to be in. By a 'thoughtful twist' I mean a round or arched window, or with a design etched in the glass, complimenting the style of your home. Just something a bit unusual that expresses the style of the home. 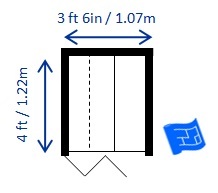 Don't forget that addition of doors (or curtain or a blind) means that it can be hidden from view. If you go for a small home office in a nook, make sure you have appropriate lighting and outlets specified in your home office floor plan. If you're getting your office built-in by a company or contractor, make sure you get a front elevation of your home office to show all the detail. 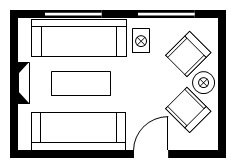 If you're thinking about a larger office the home office floor plans page is for you.